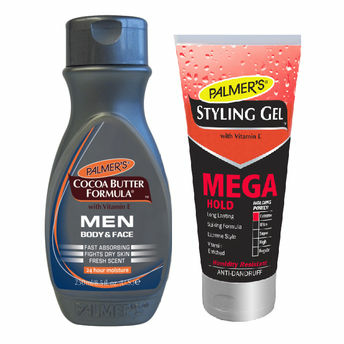 Palmer's Cocoa Butter Formula Men Body & Face Lotion is a fast absorbing formula which instantly combats rough, dry skin. Made with pure Cocoa Butter and Vitamin E for maximum protection, skin feels invigorated and well moisturized without a greasy feeling. Palmer's Cocoa Butter Formula MEN Body & Face Lotion has a fresh masculine scent. Vitamin E: a powerful antioxidant that helps reduce the appearance of scars, stretch marks and imperfections on the skin, giving a more even and toned appearance.